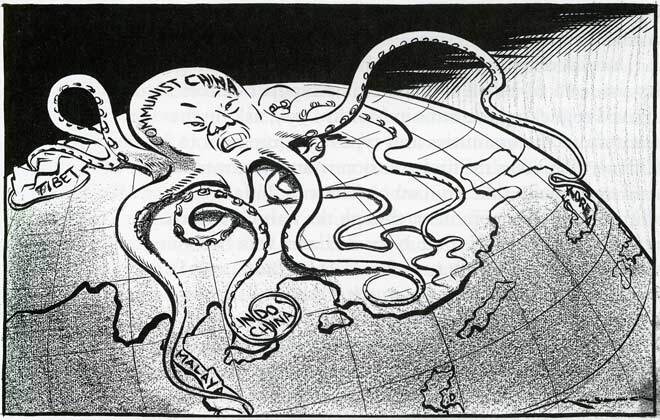 This New Zealand Herald cartoon from November 1950 illustrates New Zealand's fears of Chinese communist expansion in Asia. A sequence of events in the late 1940s and early 1950s had prompted such concerns. In 1949 the communist victory in the Chinese civil war was followed by the Chinese invasion of Tibet. Chinese intervention in the Korean War followed in 1950. Meanwhile the communist-dominated Viet Minh were fighting the French in Indochina. In Malaya the armed wing of the Malayan Communist Party fought a guerrilla campaign against the British. Within New Zealand the widespread view of these events was of an international communist conspiracy, conducted by China but ultimately directed from Moscow. The 'domino theory' became a common belief. This suggested that when one Asian country fell to communism its neighbour would be next, eventually directly threatening Australia and New Zealand. Reference: Roberto Rabel, New Zealand and the Vietnam war: politics and diplomacy. Auckland: Auckland University Press, 2005, p. 65.